In the United States, about 12,000 home health agencies deliver care to approximately 3.5 million Medicare beneficiaries at their residences.7 Medicare home health beneficiaries are homebound and often experience polypharmacy.7-9 They have, on average, 4.2 diagnostic conditions and have a higher prevalence of limitations in activities of daily living and cognitive function than general Medicare beneficiaries.10,11 Most of them receive assistance from informal caregivers to meet their medical and daily needs.12 Home health providers not only conduct professional care (eg, physical therapy and wound care) but also educate beneficiaries and their informal caregivers about how to conduct safe care (eg, proper use of medications and oxygen inhalation) and coordinate necessary resources to meet patients’ needs and expectations at home. Medicare home health beneficiaries are among the most vulnerable Medicare populations. Whether the risk factors currently used by CMS adequately adjust patient experience for home health care is largely unknown. Our study aimed to fill this critical knowledge gap by examining the interplay between agency-level CMS Hierarchical Condition Categories (HCC) risk scores (details in Methods section) and the patient experience metrics. 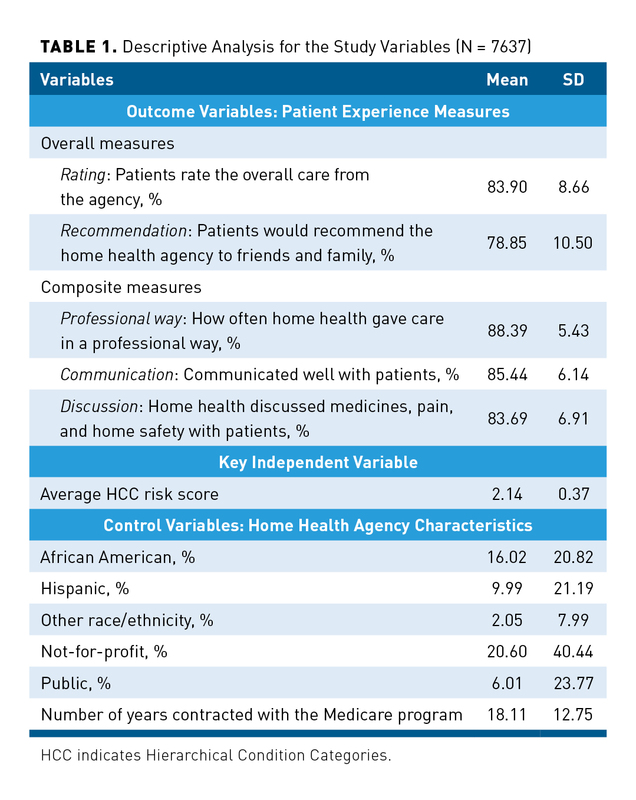 We used the agency-level CMS HCC risk score as a proxy variable for the clinical and functional conditions of home health beneficiaries within home health agencies. Associations between patient experience measures and agency-level CMS HCC risk scores from our study provide critical information about whether the current risk-adjusted model for patient experience measures needs modification. We merged 2 national Medicare databases at the home health agency level, the 2014 Medicare Provider Utilization and Payment Data for Home Health Agencies (PUPDHHA) and the 2014 Home Health Compare file.26,27 The PUPDHHA provides several agency-level variables based on 100% of Medicare enrollment and fee-for-service claims data during the 2014 calendar year.28 These variables include an agency-level HCC risk score based on the HCC risk scores from all of the beneficiaries cared for by a particular home health agency, provider identification number, number of distinct beneficiaries without a low-utilization payment episode (with ≤4 home health visits during an episode of home health care, namely, up to 60 days), and number of beneficiaries from different racial/ethnic groups. The Home Health Compare file is updated quarterly by CMS.27 It consists of provider identification numbers and patient experience measures extracted from the HHCAHPS survey. The Home Health Compare file also provides characteristics of home health agencies, including ownership and CMS certification year. We extracted agency-level patient experience measures based on data collected from January 1, 2014, through December 31, 2014. Dependent variables. The dependent variables are the 5 risk-adjusted agency-level patient experience measures from the 2 global questions and 3 composite measures extracted from CMS Home Health Compare. The HHCAHPS survey has 2 global questions; they include the “overall rating of care” provided by the home health agency (hereafter termed rating) and “patient willingness to recommend the home health agency to family or friends” (hereafter termed recommendation).29 The scale for rating in the survey ranges from 0 to 10. CMS reports the percentage of rating for an agency based on the percentage of patients who gave their home health care a rating of 9 or 10. The choices in the survey for recommendation include (1) definitely no, (2) probably no, (3) probably yes, and (4) definitely yes. The percentage of recommendation at the agency level is the number of patients who answered “definitely yes” divided by the total number of patients. The risk-adjusted global and composite measures for patient experience at the agency level are measured as a percentage. A higher percentage of patient experience measures indicates that the patients perceive higher-quality care from home health agencies. Control variables. In addition to the average CMS HCC risk score at the agency level, previous studies show that beneficiaries of different races/ethnicities rate their respective patient experience surveys differently.19,20,25 Therefore, we included variables describing the percentage of beneficiaries who were African American, Hispanic, and of other racial group, which includes beneficiaries who were not white, African American, or Hispanic. Finally, because the characteristics of home health agencies are associated with the quality of care provided,33,34 we included 2 dummy variables for ownership of a home health agency (ie, not-for-profit and public home health agencies, with for-profit home health agencies as the reference group) and the number of years that home health agencies had been certified by the Medicare program in the analytical models. Home health agencies practice within a given state, facing that state’s regulations, which may differ from those of other states. Additionally, there is high variation in home health utilization across states, with $176 per beneficiary per year for the states at the 10th percentile and $866 per beneficiary per year for those at the 90th percentile.35 We applied fixed-effects models at the state level, with robust standard errors for each patient experience measure to account for differences in regulations and other state characteristics that affect the practice of home health agencies. Stata 14.2 (StataCorp; College Station, Texas) was used for data management and analyses. We used xtreg for the fixed-effects model. There were 7756 home health agencies with data for patient experience measures available in the Home Health Compare file. Due to missing data, such as the agency-level CMS HCC risk score or race/ethnicity, the total number of observations included in our analytical models was 7637. Table 1 presents descriptive statistics. For the overall patient experience measures, the average of rating with score 9 or 10 was about 84%, and the average of recommendation with “definitely yes” was about 79%. For the composite measures, the averages of professional way, communication, and discussion were 88%, 85%, and 84%, respectively. The average agency-level HCC risk score was 2.14. Home health agencies, on average, had 16% African American and 10% Hispanic beneficiaries, and about 2% of beneficiaries identified their race/ethnicity as other or unknown. Among our study sample, 21% of home health agencies were not-for-profit, and 6% of home health agencies were public. Home health agencies had an average of about 18 tenured years with the Medicare program. The results from the fixed-effects models, in Table 2, showed that increases of 1 SD in agency-level CMS HCC risk scores (0.37 in Table 1) significantly lowered rating by about 0.75% (coefficient, –2.04, multiplied by 0.37) (P <.001) and recommendation by about 1% (P <.001), as well as professional way, communication, and discussion by about 0.6% (P <.001 for all 3 measures). For the control variables related to race/ethnicity, increases in the percentage of African American beneficiaries were negatively associated with patient experience measures in rating (–0.06; P <.001), recommendation (–0.07; P <.001), and communication (–0.05; P <.001). Similarly, an increase in the percentage of beneficiaries of other racial/ethnic group was negatively associated with patient experience measures in rating (–0.08; P <.001), recommendation (–0.11; P <.01), professional way (–0.10; P <.001), and communication (–0.08; P <.001). We did not observe a significant association between the percentage of Hispanic beneficiaries and patient experience measures. Characteristics of home health agencies were also associated with patient experience measures. Not-for-profit home health agencies had patient experience measures that were about 1 to 3 percentage points higher than for-profit home health agencies in all aspects: rating (1.74; P <.001), recommendation (2.92; P <.001), professional way (1.20; P <.001), communication (1.48; P <.001), and discussion (1.28; P <.001). Public home health agencies had patient experience measures that were about 2 to 4 percentage points higher than for-profit home health agencies in all aspects: rating (3.34; P <.001), recommendation (4.49; P <.001), professional way (1.97; P <.001), communication (1.77; P <.001), and discussion (2.10; P <.001). Increases in years tenured with the Medicare program were significantly associated with more positive patient experience measures of rating (0.03; P <.05), recommendation (0.04; P <.001), and communication (0.02; P <.01). Our findings showed that increases in agency-level CMS HCC risk score were significantly associated with lower scores for all 5 patient experience measures. The findings indicated that current risk factors insufficiently adjust for the variation in beneficiaries’ clinical and functional conditions that affects patient experience. The differences in patient experience based on current risk factors partially reflect the differences in case mix among home health agencies. CMS uses risk-adjusted patient experience to construct the 5-star patient survey rating system posted on the Home Health Compare website. The system was developed in an effort to improve the quality of home health care by allowing consumers the opportunity to find information on their community’s providers and choose the best providers. However, the CMS 5-star patient survey rating system of home health based on current risk factors could be misleading. Evidence shows that CMS public reporting affects market shares for health plans, hospitals, and nursing homes.36-38 Future studies examining how the CMS 5-star patient survey system affects market shares for home health agencies with high and low HCC risk scores are recommended. We also observed that increases in the percentage of African Americans and other racial/ethnic minority populations were negatively associated with patient experience measures, with 1 exception (discussion). Our findings are consistent with evidence from a recent patient-level study, which indicated that minority home health beneficiaries had lower patient experience rates in professional way and communication than home health beneficiaries who were non-Hispanic whites.25 Evidence from the same study also showed that Hispanic, African American, Asian, and Native Hawaiian or Pacific Islander home health beneficiaries had better experience measures in discussion than the non-Hispanic white population.25 The coefficients for discussion in our study are positive but not statistically significant. It is unclear why minorities gave a high rating for their home health providers discussing medicines, pain, and home safety but gave a low rating for the other measures. This may be explained by cultural differences among racial/ethnic groups regarding pain tolerance and differing attitudes among patients or informal caregivers about medication or patient safety. However, future studies that focus on the cultural differences affecting the rating of patient experience are needed. Evidence from other studies showed that compared with not-for-profit agencies, for-profit agencies provided higher-cost and lower-quality home health care, including worsened process of care, poor functional improvement, and high rates of avoidable hospitalizations and bedsores.33 Our study found that compared with public and not-for-profit agencies, for-profit agencies had poorer patient experience performance in all 5 measures. We also found that increases in the number of tenured years with the Medicare program increased patient experience measures by about 0.01% to 0.04%. Over the past decade, the number of home health agencies increased dramatically, from about 7500 in 2000 to about 12,400 in 2014. This increase was partly due to the high profit margin from therapy visits in the Medicare home health payment system.7 Among all new home health agencies, 95% were for-profit entities, which are more likely to target therapy visits with high profit margins.34 The Medicare program is the primary payer for home health care and paid about $18 billion in 2015.7 The Medicare program strives to improve the quality and efficiency of care for Medicare home health beneficiaries. However, with the high cost and lower quality of care associated with for-profit agencies and with the rapidly growing number of for-profit agencies, CMS’ efforts to improve quality while controlling rising home health costs are limited because the license approval system and regulations for home health agencies occur at the state level. To overcome this problem, both payment reforms at the federal level and modifications at the state level for licensure and regulation are necessary to improve the quality and control the cost of home health care. Our study has limitations. First, we used data at the agency level. The patient experience measures are based on the HHCAHPS survey from nonhospice, nonmaternity home health patients who are 18 years or older.39 However, CMS HCC risk scores are based on Medicare beneficiaries who are 65 years or older.31,32 Although the sources of patient data provided by the HHCAHPS survey and the CMS HCC risk score were not completely the same, the majority of home health beneficiaries in our sample were Medicare beneficiaries who were 65 years or older11 and were more likely to be in the random sampling of the HHCAHPS survey. Therefore, the inconsistent patient sources among the HHCAHPS survey and CMS HCC risk scores are less likely to affect the estimates in our study. However, we recommend that future studies use patient-level data to examine CMS HCC risk scores and patient experience measures. Secondly, due to missing data, we excluded 119 home health agencies that qualified for the HHCAHPS survey. These agencies were more likely to be for-profit home health agencies with lower patient volume than those included in our study. Additionally, the HHCAHPS survey exempted home health agencies that had fewer than 60 patients per year, and thus these agencies were excluded from our study. Our findings have research and policy implications that apply to the 5-star patient survey rating system and the HHVBP pilot program. In terms of research, access to care for minorities and beneficiaries with complicated clinical conditions needs to be carefully monitored under the 5-star patient survey rating system and the HHVBP pilot program. Additionally, it is necessary to investigate the practice patterns of home health agencies and the home health market and to determine how home health agencies with a high proportion of beneficiaries who have advanced clinical and functional conditions fare. In terms of policy implications, the current risk factors used to adjust patient experience measures need to be modified. The CMS HCC risk score is based on Medicare home health beneficiaries’ enrollment data and inpatient and outpatient claims data.30 The enrollment data are collected by CMS, and inpatient and outpatient claims data are provided by hospitals and physicians, so there is little chance for home health agencies to practice upcoding that may affect the CMS HCC risk score. Thus, it is feasible to include the CMS HCC risk score of a home health beneficiary as a risk factor in the current risk adjustment for patient experience measures in an effort to avoid potential unintended consequences. The authors thank Madison Hedrick, MA, of the Science Communication Group at the University of Arkansas for Medical Sciences, who provided editing for the original version of the manuscript.